For many thousands of years of man’s early history, the only remains which historians can find are the crude stone tools fashioned and used for hunting and other purposes. These tools are often found lying along the terraces of rivers where people of those times used to roam about in search of wild game or in caves and rock shelters where they used to live. The period when stone tools were used is known as the Stone Age. The Stone Age covered a very long period of time. On the basis of the quality of the stone tools used, Stone Age is divided into three phases i.e. Early Stone Age (Paleolithic), Middle Stone Age (Mesolithic) and Late Stone Age (Neolithic). In the beginning people were basically food gatherers and hunters. Hunters and gatherers often lived in hilly areas or by the side of a river or lake. They led a nomadic life. They moved from place to place in search of food and shelter. Men, women and children lived in groups to protect themselves from ferocious animals. In India, prehistoric stone tools have been found almost from all over except the Gangetic plains and the plains of Punjab. In the beginning, food was perhaps eaten uncooked because humans had yet to learn the use of fire. In Paleolithic period itself humans learnt the use of fire and started eating cooked meal. Fire helped them to keep warm during the winter. They gathered around it and listened to the stories from elders. It also protected them from wild animals. The discovery of fire was accidental. The striking together of two pieces of stone called ‘flint’ produced a spark which, when it touched dry leaves and twigs, burst into a flame. Fire was a thing of wonder to start with, but later it came to be used in a variety of ways and contributed to many improvements in the pattern of living. In the beginning human beings lived in groups in caves and rock shelters or amidst the leafy branches of large trees and in open. But later they started building small huts supported by wooden posts and thatched it with grass, leaves and sometimes with hide. The skins of the animals killed as well as the barks of trees and large leaves were used as clothes. In the caves and rock shelters they spent their leisure time in painting and carving on the surface of caves. Paintings show animal groups, men and women dancing, hunting and food gathering and other aspects of life. • Early Stone Age tools – A pebble tool used as a chopper, hand-axe, cleaver etc. • Middle Stone Age tools – Borer, arrow-head, scraper etc. • Late Stone Age tools- point, crescent blade, scraper etc. Flint was used, together with other types of stone, for making tools and weapons. Some of these were found in the riverbed in the foothills of the Himalayas or in certain parts of the Deccan plateau such as the Narmada valley. In some places, such as the Kashmir valley, the bones of animals were also used. Archaeologists called these stone implements ‘artifacts’. About ten thousand years ago, people started learning to produce their own food. It was discovered that by putting seeds in the soil and watering it, plants would grow. This marked the beginning of agriculture. They grew barley, rice, or wheat. They were to be found all over India but more often in river valleys because water was available in plenty and soil was fertile. So it is easier to grow crops. They now began to domesticate animals like goat, sheep, cattle and pig. Besides dog, the earliest domesticated animals were sheep and goat. Tools were made of stone which were grounded and polished, for example-digging stick, axe, sickle, grinding stone. They learnt the technique of making vessels and jars out of clay and baskets from bamboo and kept the grains in them. In the beginning, clay pots were made by hand. They were then dried in the sun or baked in kilns to make them hard. Later, wheels, like today, were used to make pots. The discovery of the wheel made a significant difference. It was also used to spin cotton and wool and weave cloth. After sometimes it was used in making transport vehicles like bullock carts and chariots. Copper was the first metal to be discovered. Later, copper was mixed with other metals such as tin or even Zinc and lead to make a new metal or alloy, called Bronze. The period when man began to use metal together with very tiny stone implements is called the Copper or Bronze Age (or the Chalcolithic Age). ‘Chalcolithic’ means copper and stone. Copper and Bronze axes and knives have been found at Brahmagiri (near Mysore) and Navda-Toli (on the Narmada). When people began to settle down and grow their food, they continued to live as a large group but functioned more through family units than the group. A number of families would constitute a village, so that mutual protection and help was still available. Archaeologists have found many remains of these villages and from these ‘sites’ as they are called. The chalcolithic potter sometimes decorated his pots with beautiful designs. The women who made pottery did not use the potter’s wheel. Only the men used this. They were fond of ornaments and decoration. The women wore ornaments of shell and bone and carried finely worked combs in their hair. They invented the technique of spinning and weaving cloth from the fluffy substance of the cotton plant. Leisure hours were given to fun and amusement. People were afraid of death and thunder and earth-quakes because they did not know what caused them. Some men gave more thought than others to these questions and suggested answers. There was a sky god who allowed the sun to travel across the sky each day. The earth was like a mother feeding her own children with crops and plants. If the sun was to rise each morning and the earth to bear crops, then the sky-god and the earth-goddess must be worshiped with sacrifices and hymns. Small clay images were also made of the earth-goddess in the form of a mother, and these were widely worshiped. So some of the men became ‘magic men’, who claimed they could control the weather and cure illness and prevent the people from being harmed. Later, there arose a group of priests who performed the sacrifices and sang the hymns on behalf of the whole community. Death was a journey into another world from which no one ever returned. So the dead were buried in graves or when a child died, it was placed in a large pot or urn which was buried. The grave was sometimes lined with large slabs of stone. Objects like pots, beads, tools etc. were placed along with the body. It was believed that the dead person might need them. There was still one thing which they lacked and which prevented them from advancing more quickly. They did not know how to write. The knowledge of writing was to come at a later stage, when cities came into existence. Over the years some of the smaller villages grew into large ones. New needs arose and new occupations were started due to increase in number of people. 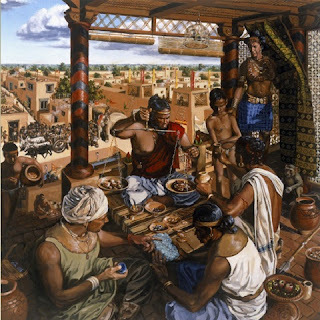 People in these large villages were prosperous because they were now producing more food than they required for their needs, so they could exchange this surplus foods for other things such as cloth, pottery or ornaments. Now it was no longer necessary for every family to work in the fields and produce its own food. Those who were weavers, potters or carpenters exchanged the articles which they produced for food grown by other families. Gradually as trade increased, the craftsmen began to live together and such villages grew into towns. Living in towns is generally taken as the start and sign of civilization because it is that stage of the development of human culture when people look more than just the satisfaction of material needs. Exchange encourages the development of technology. A more efficient control over nature and resources gave people greater leisure to think and to improve the quality of their life. Invention of writing at this time was a great step forward. It meant that knowledge could be passed from generation to generation and this knowledge would be available to a large number of people. The spread of the use of writing was often accompanied by the growth of towns since traders needed to keep accounts and records. The growth of towns also led to a greater degree of economic differences among various groups. There was a need for more detailed laws to govern the communities. There was now occasion for some people to speculate about the Universe and the human condition. This also led to diverse religious beliefs.